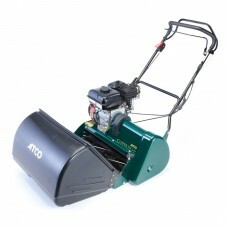 The Atco Clipper 20 Club model is fitted with a recoil start Briggs & Stratton 4-stroke engines has power drive and a centrifugal clutch with variable forward speed controlled by the engine throttle. The model includes an infinitely variable cutting height adjustment from only 4mm to 27mm. Suitable for lawn-sizes up to 50m x 50m. The Atco Clipper 20 Club model is fitted with a recoil start Briggs & Stratton 4-stroke engines has power drive and a centrifugal clutch with variable forward speed controlled by the engine throttle. Att he heart of this machine is the cutting cylinder. With 10 blades the Clipper 20 Club cylinder achieves 565cuts per metre and is suitable for light commercial as well as domestic use. A single control point allows infinitely variable adjustment within a cutting height range of an amazing 4mm to 27mm.